Residential Comcast customers will have new data limits starting next month. Cable giant Comcast announced today that, starting August 1, residential customers would be limited to one terabyte of data usage per month using their existing internet plans. While Comcast utilized data limits in markets with little to no competition for broadband internet in the southern and eastern United States, Chicago will be the largest market yet to receive data limits. The cable giant said in an email sent to customers that it believes less than one percent of customers would be affected by these new overages and provided tools to estimate monthly data usage. With 1 terabyte of data you can stream about 700 hours of HD video, play more than 12,000 hours of online games, or download 600,000 high-res photos in a month. Customers who exceed the one terabyte ceiling will be charged for the overages at a rate of $10 per 50 gigabytes used, up to $200 per month. The company also offered an unlimited data package without caps at an additional $50 per month. While customers currently aren’t exceeding the one terabyte threshold, the new limits hinder future internet usage for many customers. As demand for digital movies, television, music, and software grows, customers will use more of their monthly internet. Microsoft for instance distributes its software, including Office 365, via download over the internet; gaming platforms like Xbox, Playstation, and Steam provide video games for download, with some games using as much as 50 gigabytes or more. Along with increased usage of digital platforms, customers using streaming video companies have begun receiving higher quality 4K video, which requires more bandwidth, cutting Comcast’s 700 hours of HD video estimation in half or more. When coupling this with platforms recently focusing on digital downloads, customers could find themselves up against the cap quickly. How this affects our clients. At Lake Cook Reporting, we rely on high speed internet to deliver the best experience for our clients. Simply put, the existence of limits on usage for our customers makes it harder to deliver our services. Our company provides video conferencing bridging services for our clients who would prefer to work from home and video conference into our office. Because we stream high definition audio and video, our clients might have to monitor their usage when using our services in the future. Along with video conferencing, we’ve offered digital case archives of all transcripts, video depositions, and exhibits taken by our court reporters and legal videographers. If a client needs a file at home, they’ll have to think twice about how a download of case files will affect their monthly allocation. Security vulnerabilities with the notification system. Notifications – Should you approach a terabyte of usage, we will send you a courtesy “in-browser” notice and an email letting you know when you reach 90%, 100%, 110%, and 125% of that amount. Usage notifications will not be sent to customers who enroll in the unlimited data option. Simply put, Comcast will use website code to insert their own messages into any website you visit. So, if you visit a site like Lake Cook Reporting, a news site like CNN, or any site that isn’t encrypted, the company can place messages or ads without customer consent. This mechanism for inserting data into websites, referred to as a man in the middle attack, is often used by hackers to extract data from unsuspecting users. While Comcast currently uses the technology just for notifications of data limits and to alert its customers when they need a modem upgrade, it could eventually be used to serve advertisements and track user behavior (along with the possibility of being exploited by hackers). 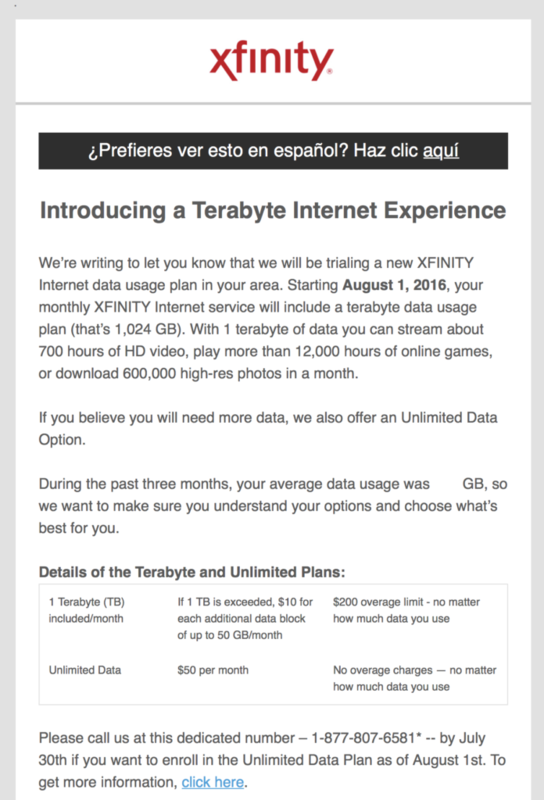 Current Comcast customers who have issue with the new data limits can purchase the unlimited internet package for an extra $50 a month. Customers can also contact the FCC to voice their opinion about data limits. The company also offered leniency for customers who go over their limit for the first few months of the program. For the small percentage of customers who use more than a terabyte of data, we will offer them two courtesy months so they will not be billed the first two times they exceed a terabyte while they are getting comfortable with the new data usage plan. 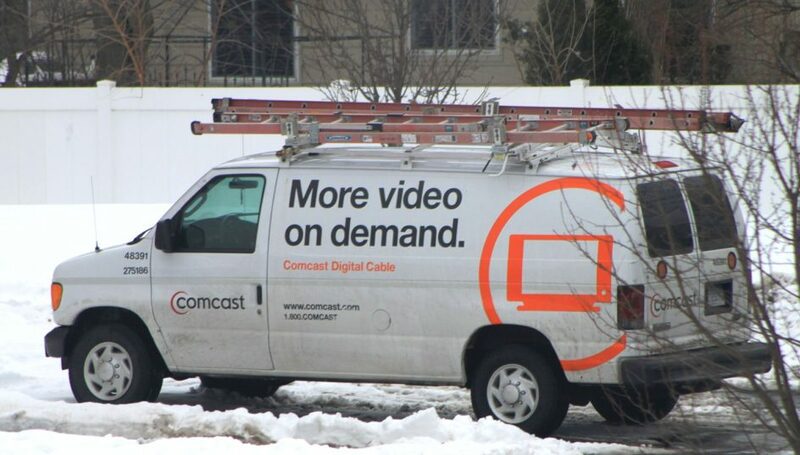 While Comcast officially labels the measure as a “trial period” for the Chicago area, analysts expect the company to deploy the service nationwide in the near future.